Over the past two months, the trucking market has been relatively stable. Volatility has died down and the runaway spot market has cooled. This does not mean freight volumes have contracted, nor does it mean that contract pricing has stopped appreciating. It just means that participants have caught their breath for the first time in twelve months. But this is about to change, courtesy of Florence and the FEMA machine. According to the Weather Channel, Tropical Storm Florence has regained Hurricane strength and is intensifying as it moves towards the Carolina coast. If the current trajectory holds, the storm is expected to hit the Eastern coast on Thursday between South Georgia and Southern Virginia. If this happens, expect utter chaos to hit the freight markets. We’ve talked about a black swan event triggering more volatility in the freight market and if the storm hits as a Category 3 to 5, it will wreak havoc on spot rates and capacity in the market. Much like the hurricanes I was personally involved in from 2003 to 2005 (here is my story), these storms drive significant demand for trucking services, disrupt supply chains, and throw our market off balance. Combine this with an exceptional economy and peak season around the corner, and you can expect massive volatility and runaway spot prices. Here is why Florence, assuming it hits with any real strength could be a “Black Swan Event” for the freight markets and unlike any storm we have seen before. It all has to do with location. What is different about the freight markets in 2018 that didn’t exist in 1996 is the significant role our Eastern ports play in our national freight network. In those days, supply chains were far less dependant upon just-in-time inventories and world trade, and the West Coast was a huge part of the North American retail supply chains. Today, the Eastern Seaboard has the fastest growing ports in the United States, with Norfolk, Savannah, and Charleston playing an increasingly important role in our import trade. In 1996, Norfolk was starting to become an important part of our national freight network, having started intermodal operations back in 1989. In 1996, the port handled 9 million tons of cargo. In 2017, the port of Virginia handled 21.9M tons of cargo. By some estimates, the number is on track to top 24M tons of cargo this year. Savannah was a relatively small port back in 1996, having recently expanded to accommodate larger ships. Maersk, the largest container line in the world, started making Savannah stops in 2000 and the port didn’t even have an intermodal terminal until 2001. Today, Savannah is the fourth largest port in the United States and remains one of the fastest growing. Savannah handled just 14 million import cargo tons in 1996. It is projected to handle over 36 million tons of cargo in 2018. Even with the growth of the port in total tonnage, container volumes have simply exploded. In 1996, the port handled just 650,253 TEUs. It should handle over 4.2M this year. Charleston has also grown incredibly over the past few decades, benefiting from the macro-trend of East coast port growth. The port of Charleston is the sixth largest port by volume in the United States, handling over 200,000 TEUs a month. Back in 1996, the port handled half that volume. 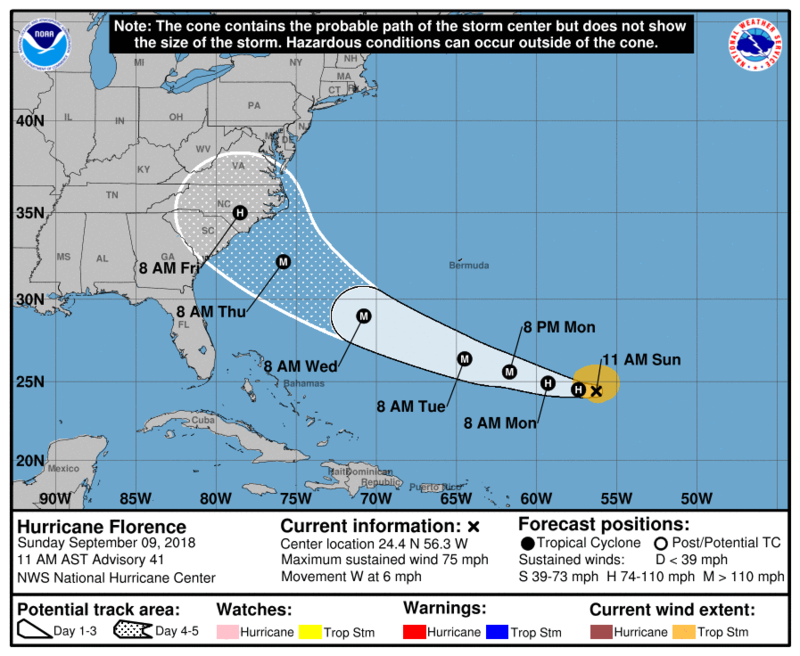 Florence is expected to hit near the midpoint of September, which is commonly regarded as the start of peak season for the freight markets. As retailers ramp up their supplies for the holidays, they are starting to receive import goods at the ports. These goods will cycle through freight networks and make their way into inventory starting in late October. Any disruption of the ports will play havoc on freight networks. Retailers will be forced to look at other ports or areas to bring in imported goods and this could trigger run-away spot market inflation yet again, leaving retailers with an uneasy feeling of deja vu from last year’s mother of all capacity shortages. Relief supplies will also place significant demand from overtaxed freight networks. A category two hurricane results in thousands of loads of relief supplies, a category three and above can be measured in the tens of thousands of loads. If a strong storm ends up making landfall, all bets are off. Relief supplies will be transferring for weeks to come, causing significant pressure on capacity at the end of the quarter. If last year is an indication, carriers will jump at the chance to maximize their spot market opportunities as the relief task orders start to flood in. Of course, large storms also cause inflationary impacts on the freight markets for months to come, as the Federal and State governments flood local economies with dollars for rebuilding areas devastated by the storms. Expect this year to be even bigger. We are in the midst of a very important election and Republican politicians will want to be viewed as proactive and on top of things, especially in areas that tend to be loyal to the party. This, of course, will drive significant demand for truckload, bringing in materials to rebuild homes, businesses, and infrastructure. Stay tuned to FreightWaves as we provide ongoing coverage of the impact of Hurricane Florence on the freight markets and don’t forget to subscribe for updates. Our news content is ALWAYS free.